Canadian twins Tegan and Sara Quinn went from their high school graduation to a summer tour opening for Neil Young. Since then, their songs have been performed by, among others, the White Stripes and Ryan Adams and prominently featured on movie and television soundtracks. 2010 finds them touring America to promote last fall’s strong, sixth album, “Sainthood.” In preparation for the band’s appearance at Milwaukee’s Riverside Theater March 25th, Tegan Quinn talked to MAXIMUM INK about Sainthood, song-writing and happiness. MAXIMUM INK: What separates “Sainthood,” from your previous efforts? TEGAN QUINN: It was completely opposite from, “The Con.” For, “Sainthood,” there was a lot of pre-production where the five piece came into the studio and recorded live off the floor. We are all stronger players and writers since, “The Con,” and we wanted something that translated easily into a live setting. “The Con,” had lots of post-production with layers of overlapping tracks where, “Sainthood,” had very few overdubs. MI: “Sainthood,” also seems to have a fondness for new wave Eighties sounds - you were born in 1980, did you groove to those sounds as a kid? TQ: We had young parents so there was lots of music around from that era - The Police, U2, Cyndi Lauper, Bruce Springsteen. As kids we were into a Canadian band called the Mini-Pops. MI: You had two producers on this CD. Was it a collaborative process or did they divvy up songs between them? TQ: We worked as a group although Chris (Walla) was much more involved in the pre-production than Howard (Redekopp) and we already had extensive demos before we even hit the studio. MI: In your mind what distinguishes a Tegan song from a Sara song? TQ: We have similar voices and experiences, but to me I’m more rock and Sara is more pop and dance. 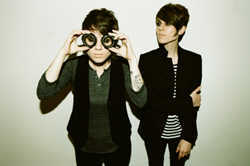 In the beginning I felt our albums were more Tegan songs and Sara songs, but now it feels more like Tegan and Sara songs. MI: The lyrics in “Sainthood,” suggest a search for fulfillment and a need for completion. TQ: As a Virgo I am a control freak. It is really my best and my worst trait. I need to see things all the way through. MI: Is it easier for you to write songs or record them? TQ: It’s easier putting out demos than it is to work them in the studio, although I find myself in a good place these days; happy and healthy. I am actually finding it more difficult to write - everything’s so nice, there always seems to be better things to do. MI: Twelve years on the road right after high school must have been difficult; do you ever feel like leaving the business? TQ: I love music and am so happy to be doing what I do. I think we tried to climb the ladder one rung at a time. We set reasonable goals; a van, headlining and accomplished them moving steadily up to where we are now.